...when will the Summer rain stop? ...it rained on me! I just wanted to play. ...A New Book That Surged My Tatting Fingers On! 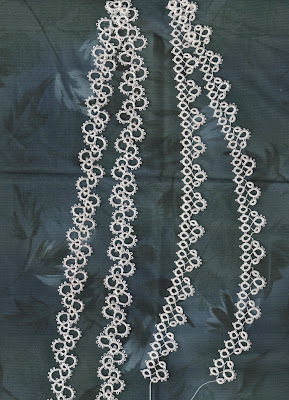 I have few books for tatting instructions ...how to Celtic, how to needle, how to shuttle and numerous pages of patterns for tatting from online, doily this, edging that, motif those. I wanted something more or different to do. After Christmas I batted my puppy dog eyes (hubby says they are) at Hubby for a book that I wanted for Christmas but did not get. He faltered (I am so bad, I knew he would) and said for me to order it. I ordered it and it arrived sometime last week. I have been tatting my fingers off with glee! After all, this girl here received lots of threads and shuttles for Christmas... from that sweet Hubby! ...A Special Tatting Shuttle For Giveaway! A mutual tatter friend who blogs at Tatting Tales ~ All things Tatting (It's an obsession) is having her Mondo Monday Giveaway! Click this link to take you to her blog for the details!